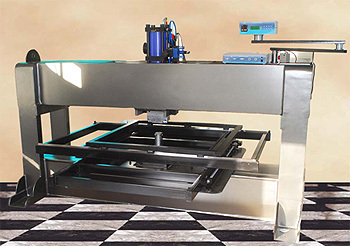 The Hologram Recombining Machine is designed for creation of Wide Web diffraction pattern shims for embossing. Pulsed energy embossing from Nickel Shims into a thermoplastic surface, enables high fidelity replication of surface relief holographic and diffractive information. The recombining system is available as a stand along unit or in combination with holographic origination and production equipments. The below mentioned specification are for Model: INFINITE – 20. Custom machines are available for specific applications. The Image transferring system of recombining from small Nickel master to Thermoplastic surface, step by step with required space shifting will be controlled by PC with Windows based software. All required software & PC will be provided with the machine.